So much has happened for us in this past year. There just are not enough words to tell all the stories and to convey our joy over what God has been doing in our lives as a family and through our lives in this work of Bible translation. Let me share a few pictures with you then to try to capture the highlights of 2012. Working with a team of national men from Papua New Guinea in January along with their missionary translator, a good friend of ours who is also a Canadian. After four months of Army Boot Camp, Glen graduated in February 2012. He was one of three recruits chosen to march in the flags, and he had the honor of carrying in the Canadian flag. Most of March and April, Norm worked in Madang where our field office is for Pioneer Bible Translators. He worked with national men from two language groups and checked the books of the Gospel of John and the book of Daniel. In June, our family celebrated Jill’s birthday (with Glen’s picture in the background); Norm enjoying freedom on his electric scooter; and visiting the Calgary Stampede in July. After being away for three years, we visited three churches in PEI and Nova Scotia to tell about the great things God is doing through the work of Bible translation. On an off day, we would go spend a day together on the red sandy beaches and cold Atlantic waters. We were thrilled when Glen was able to come home for two weeks in September. We had our family together, including a special meal time with my mother, and my brother and his wife. For the benefit of my health, and to work on translation projects, I was going to be in Dallas for two months away from Jill. We were able to have a short holiday of fun before I headed south to work at the center where our International office is for PBT. In the middle of this, a trip came together to visit four of our supporting churches in Illinois. This verse is perhaps one of the most important ones in the entire Bible. In it, the Creator God (Elohim) reveals His personal name (YHWH) to Moses. He goes on in the next verse to explain that He did not reveal His personal name to Abraham, Isaac or Jacob. But from now on, the people of God would come to know Him in a personal and powerfully intimate way, as the Israelites (and now us) became His people, and He truly became their God. During the summer months, Norm spent many hours studying the “Basic of Biblical Hebrew” to be able to once again read the Old Testament in its original language. It had been 18 years since he last took a Hebrew course, and he is so glad to be able to get back into the OT text again. 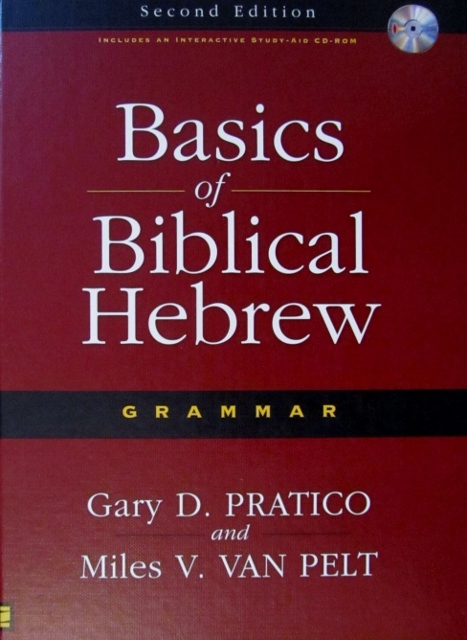 The reason that Norm first studied the basics, and then now is working at understanding the various discourse features of Hebrew (such as narrative, instructional and hortatory discourse and poetic style), is so that he can be ready to do consultant checking of Old Testament books for various translation projects. In our next trip to Papua New Guinea (Jan – May 2013), Norm will work with one language team as they do the final checking and the revising of Exodus 1-24, and Psalms 101-150. Pray for everyone involved in this translation project that they will be able to find the right words and sentences to be able to express these OT portions well in the language of the people. In just a few weeks, Norm will be spending two months (Oct. 25 – Dec. 18)in Dallas to work on the various translation projects from there, instead of back in Calgary. While in Dallas, Norm will do much of the initial checking of Exodus 1-24 as mentioned above. He will also work on preparation questions for the books of James, 1 & 2 Peter for the Tay translation in PNG and James and Jude for the Mborena Kam project, also in PNG, which is being done by national translators. 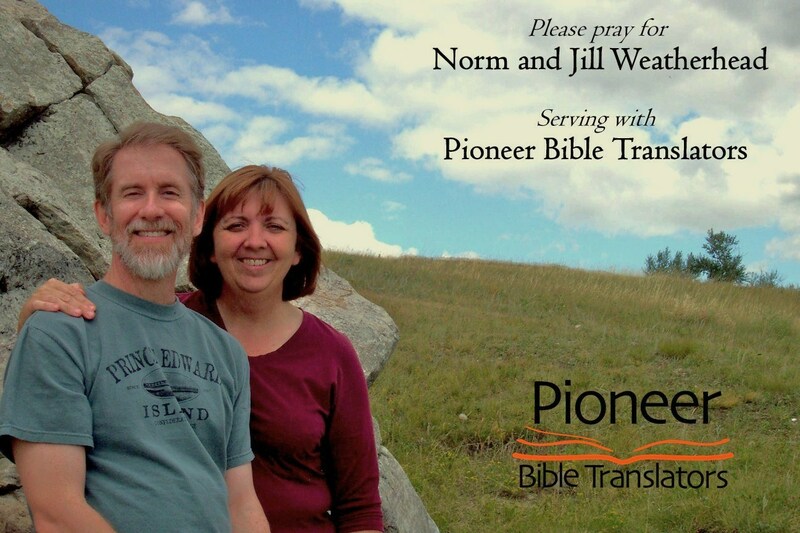 Please pray for us as Norm goes south and Jill stays in Calgary and continues to work at the Foothills hospital. We thank God that Jill has been able to get many overtime shifts which she then banks as hours into the future so that she will be able to be with Norm longer in PNG. We are also so grateful for the prayers of so many people for God to bring healing to Norm. It was especially moving when the churches which we have just visited called us up and prayed over us. We see some great improvement, so keep on praying. We praise God that all of our children are doing well. Our older son was not only was able to stay on working full-time with H & R Block after the regular tax season at their Call Center, he was also asked to become part of a special team that would totally rework the interface and the graphics for the website of their company. His wife is continuing to get good praise reports at her job, and has moved from being cashier to working in the Flooring Dept. Our second son, on the other hand, has been on the move a lot this year. He finished his Army Basic Training in Quebec back in February. Next he went to a base in Borden, Ontario for a few weeks before doing his Soldier Qualification course in Gagetown, New Brunswick. Now he is back in Borden for his last long course to get trained in his area of being a Vehicle Technician for the Army. It was wonderful then when he was able to come home to Calgary on a two-week leave period in September. We packed in as much family activities that we could: a zoo day, movie outings, a few family BBQ’s, pizza and movie nights and lots of good visiting. We are proud of all of our kids who are maturing well in life and in their faith in God. 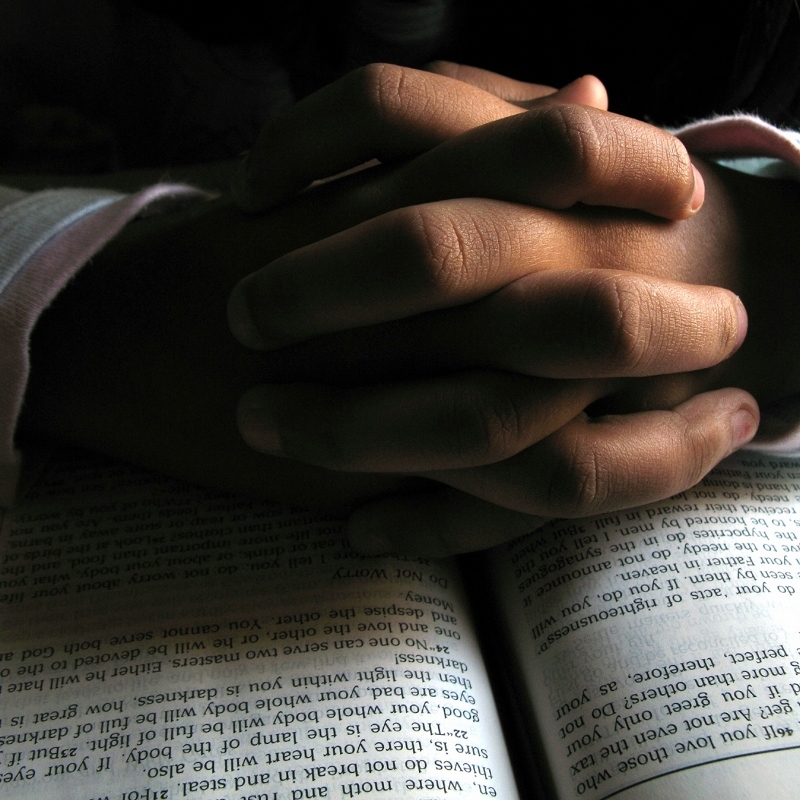 Please continue to lift them up in prayer as they seek to make an impact for the Lord in their world around them. Many of you know that for almost two years now, Norm has been writing articles in a devotional blog site called “The Listening Post”. This has been so therapeutic for him over the past two years. In his articles, he shares a lot about the ministry work that he has done, and is still doing in the area of Bible translation. He also shares insights into spiritual topics that are based on a couple of Christian books, one of them by Max Lucado. And currently, he is doing a weekly Bible study as he goes through the Gospel of John. Click on the title above, or on the words “Sermon” or “Trailer” below to link to the stories. So this is what is happening for us. 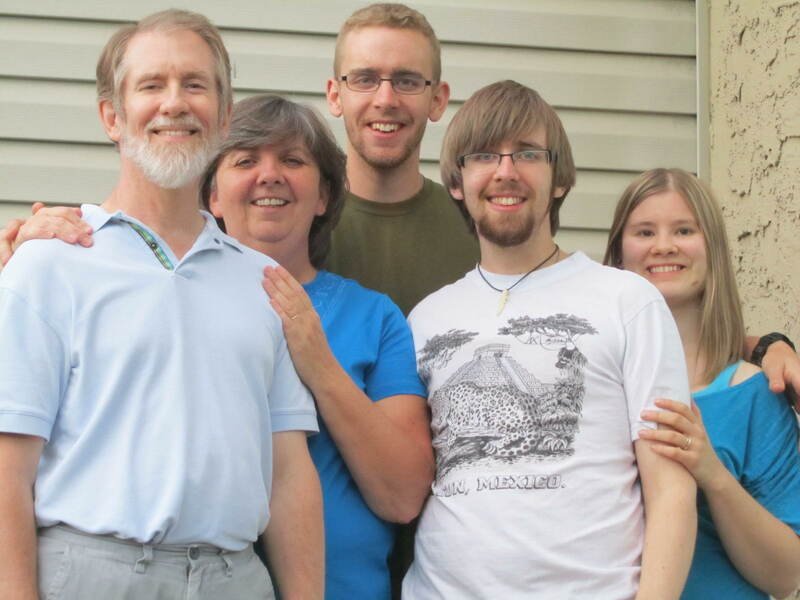 We would ask you to please keep our family in your prayers as we all seek to serve God in our various ways. Please pry for the time of separation that is coming up for me and my wife that we will be okay while I’m gone. Pray I get much done in my preparation work while in Dallas so that I will be fully ready to do the consultant checking of 6 New Testament books and 2 Old Testament books for people of three different language projects. May God bless you richly as you remember us and our work in your prayers. When I tell people that I am a Bible translator, they often ask me if I am a member of Wycliffe Bible Translators. That’s not unusual since WBT is the single largest Bible translating organization in the world and has been around for over 80 years now. So I respond, “No, I’m with a smaller group called Pioneer Bible Translators.” And you can read here about how PBT first got started in the States back in the ‘70s. When I say I am with PBT of Canada, then people want to know how it began. This is a great story and I love to pass it on. It goes back to the early 90’s when Jill and I were seeking direction from God as to how we could be involved in the overseas ministry of Bible translation. Ever since I was a teenager I was interested in becoming a translator. In 1990, Jill and I attended a month long orientation course in California put on by Wycliffe which allowed us to see what they were like and they could get to know us. That course confirmed for me that this is what I wanted to do as a ministry. At the end of the course, the recommendation was that Jill and I stay settled a little longer in Canada, get our debts reduced and strengthen our marriage before we head to the mission field. So we spent the next couple years doing pastoral ministry in Central Canada and worked on all the things we were told to be working on. We got to the point where it looked like the timing was right to move ahead with our application with Wycliffe. We sent in all our paper work, but we didn’t hear back from them. So life carried on and our family by this point in 1993 was in Prince Edward Island in the Maritimes of Canada. In talking with a good friend at that time, the question came up about whether I was going to go into mission work. The desire was there, but the timing wasn’t right. But from that discussion the door opened to pursue my biblical languages again and we moved to Lincoln, IL. I loved the Greek and Hebrew studies. And then someone introduced me to one of the staff of the school who just happened to be on the Board of Pioneer Bible Translators. In September of 1994, I began my two years of linguistic studies, mostly in Dallas, but also one summer in North Dakota. Part of PBT’s training was to attend two one-week courses held each June to get more familiar with PBT and get ready for field ministry. We took our second course in 1995. At that time, the Board also met to make decisions for the mission. As students, we were invited to attend one of their sessions. After the hour together with the Board, the Chairman asked us all if we had any questions or thoughts to share. It was at that moment that I believe God empowered me to speak up and say, “One day I believe there will be a PBT of Canada.” Everyone in the room paused to consider this thought and then they broke out into applause. What a wonderful moment that was to think about what God might do next for us and through us. There was a very practical reason for wanting to believe that there would one day be a PBT of Canada. As Canadians, there was no legal way for churches or individuals in Canada to send money to PBT-US to help support the work we would be doing and be able to get a charitable donation receipt. There had to be a Canadian mission agency existing through which we could be sent to the field and through whom people could send their donations. Many discussions were held between me and Rondal Smith, the president at that time of PBT-US. We both felt that we needed to have a meeting with Canadian pastors. I told him about the annual “Pastors and Wives Retreat” held in western Canada each winter and suggested that we try to speak with them at that time. We did get an invitation to attend the Retreat and Rondal spoke for a half hour one afternoon challenging the pastors to consider started a Canadian organization and help in the task of bringing God’s Word to the Bible-less peoples of the world. We announced that we would have a meeting that evening for anyone interested in starting a PBT of Canada mission. Quite a few pastors said yes. The funny part about this story is that the Retreat was held at a hot springs resort, and wanting to enjoy the facilities while having this meeting, we all agreed to get our swim trunks on and meet in the hot pool. And that is how PBT of Canada started. From that famous “Hot Pool Meeting”, a handful of pastors worked with us to build the foundation of a new Canadian mission. In June of 1996, it was announced at the annual PBT training course that PBT of Canada had just been granted its official status as a Christian Charity in Canada. Eight months later, on February 15th of 1997, Jill and I and our two young boys stepped on to the soil of Papua New Guinea to begin our career as a Bible translation family. Praise the Lord! Two weekends ago marked a historic moment for Pioneer Bible Translators. I was fortunate enough to be able to attend the celebration event, the Dedication of the new PBT office building in Dallas, Texas. There were at least 250 people, many of whom had flown in from all parts of the country, plus some of our missionaries from overseas, who came to attend this special event. This is truly an amazing building that was just a dream a few years ago, and a hope for even longer than that. Inside this beautiful 5000 sq. ft. building there are many offices, a large reception, a conference room, and a huge dining room area with a kitchen nook. There is even more to it than that, but that should give you an idea of how large the building is. 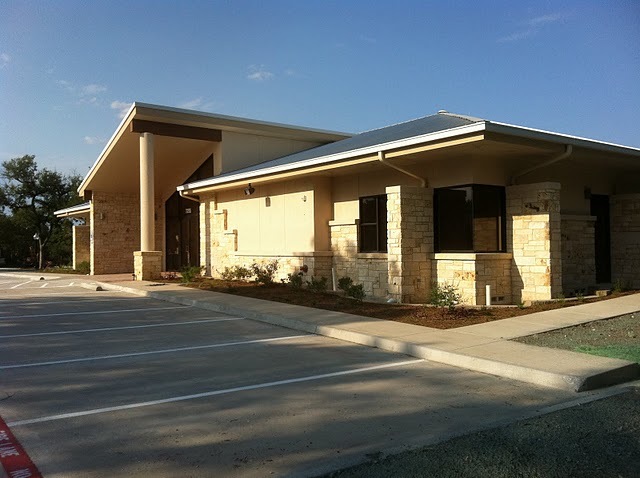 What is even more amazing than turning Texas scrub brush land into PBT’s first permanent International Service Center building, is the fact that every area of the building is already fully staffed and operating. Our old modular building, which had housed up to five staff members in each small office area, sent over as many staff as it could, but it too is still operating various departments within each of its office spaces. To appreciate the rapid growth of PBT’s home office, let me take you back to 1994. This was when Jill and I and our boys moved to Dallas, Texas to begin my linguistic training so that I could become a Bible translator. At that time, PBT did not have any building at all. Rather, we were renting two small offices inside of the Pike building which primarily housed the library of SIL (Summer Institute of Linguistics), a close partner of Wycliffe Bible Translators. One office was for the president of PBT, Rondal Smith, and the other one was the administrative office of the finance people and receptionist. There literally was only a handful of staff members back then. It would be another six years or so before PBT built a three-wide trailer modular building to handle about a dozen staff members and also have an open front lobby area plus a large conference room in the center. A good foundation was laid then by the time that PBT chose its next president, Greg Pruett, in 2006. We had seen steady but gradual increase in staff in the 12 years. The same can be said of our missionaries and our personnel on the field during this time. But considering the pressing need to get more Bible translation happening around the world, all of us knew that some changes would need to be made. It was time to really grow in order that we could get the task done that God had given to our mission. Let me explain what our sense of urgency was and still is. Linguistic research has shown us that there are almost 7,000 languages still spoken in the world today. But can you believe that there are over 2,200 of those languages that are still waiting for a Bible translation program to be started in their language? This represents hundreds of millions of people who still do not have even one verse of the Bible in their language. It is our strong conviction, as well as for many others, that to be able to lead people to faith in Christ, to disciple these new believers, and certainly to plant strong and multiplying churches, it is imperative to get God’s Word to the people, especially in written form. And that is why PBT’s primary focus is to transform lives through translated Scriptures and supported by church planting and Scripture impact initiatives. Back to some historical data now, when we officially became members of PBT, there were about 85 career members. This too also grew in a gradual but steady upward climb, so that 10 years later there were 182 career members, with just less than half of them being missionaries in assigned overseas fields. But as I said above, our leadership knew that we would have to make some significant changes to address the global need for Bible translation. Under Greg’s leadership, PBT envisioned recruiting 200 more members to more than double our organization, to begin a number of new projects and to start working in at least four new countries of the world. To do that though, a much stronger infrastructure and more support personnel would need to be put in place here in Dallas. That became a large part of the reason for why we needed a new permanent building. And so here we are nearing the end of PBT’s first six-year plan to expand our mission organization in order that we can in turn impact more language groups of the world. And how have we done you ask? We currently have 322 members, and so many recruits who are in the process of becoming members, that it looks like we very well may reach our goal. Also significant is that we have doubled the number of missionaries on the field, and we have just more than that in the number of members who are training to go to the field. This means we are looking at an explosion of growth in our projects around the world. Let me now finish this article with an important thought. It may look like PBT right now is all about “numbers” and just growing the organization. That is the furthest thing from the truth possible. Rather, we have recognized the great need for getting God’s word into the hands of the people of all languages. We are simply mobilizing the resources that God has placed in front of us to see this task completed. And one more important thing to mention. Above all else, Greg has emphasized that our fundamental strategy to see this being done is that of prayer. God has always challenged His people to dream big dreams and to pray for the impossible. That is when God shines through the best, and that is what He has done for PBT. Stay tuned, there are more great stories to come. At last! After many years of thinking, dreaming, and praying about the idea of me becoming a Bible translator, the time was now at hand. At least, it was the beginning of the beginning. We had just finished living in Lincoln, Illinois for a year, and then we made the move down to Dallas, Texas. This was where I was going to do the linguistic studies that I would need to be able to become an effective Bible translator. It was in 1976, that I saw firsthand what Bible translation was all about, when I visited the missionary couple who were living in the mountains of Peru. I was fascinated with the idea that you could learn the local language used by the people and then translate the Bible into that language. Now, 17 years later, I was finally going to start to pursue this dream of becoming a translator myself. My life became very busy that fall of ’94 and winter of ’95 as I dug into courses like Phonetics, Phonology, Grammar, Language Acquisition, Culture and Society, Field Works ( where we learn to use computer programs to help us analyze language data), and many others. And life was certainly hectic for Jill too as she also took some of the foundational linguistic courses, helped to take care of the boys, and also worked at a nearby hospital. While we were there, our family lived in a dormitory building where many other linguistics students were staying as well as a few families. In many ways we shared our lives together as we studied together, lived in the dorm together, and also ate meals together in the cafeteria up the hill. It was an exciting time as most of us were here training to become missionaries and be involved in some capacity in actual translation projects, or in support roles to help those who are doing translation. Besides concentrating on the studies, one of the most important questions that we needed to answer for ourselves was where we wanted to go in the world. At that time, Pioneer Bible Translators was working primarily in three countries or regions of the world. They had a Branch in West Africa, East Africa and Papua New Guinea. They also had a small project starting in the Ukraine. You will find out later that our family actually did go to Africa, but in the ’80s and ’90s, I had a strong pull of wanting to go to the Pacific Islands region of the world. I also felt old, considering that most of the students were in their 20s and I was now in my mid 30s, so I wanted to go to a well established Branch, and it also appealed to me to consider working in a project that had already been started. I believe that it was God’s providential guidance that Jill and I were able to become acquainted with a couple from PBT that had worked in a translation project in PNG, but for health reasons were back in America. We visited and e-mailed each other many times over the two-year period before we actually got to PNG. Even more amazing, was that this man had produced a grammar of the people group that he had worked with and I was able to use that as part of a research project in one of my graduate study courses. After taking the fall and winter courses of linguistics in Dallas, our family traveled to North Dakota where some summer linguistic courses were offered. That was very intense since these advanced courses, which were usually taught over 14 weeks in Dallas, were taught in only eight weeks. We spent the Fall in Calgary before returning to Dallas, to finish my last semester of my linguistic training. So finally, after a year and a half of studies, our family was prepared to leave North America and travel to PNG to live among the people of a remote area and learn their language and translate the Bible into that language. There was just one little detail that needed to be taken care of though. We would need to raise missionary support for us to be able to live and work over there in PNG. In some ways, this was much more challenging to us emotionally and spiritually as we realized that we would need to depend on God and God’s people to raise up the monies that we would need. As much as we were able to, during ’94 and ’95, we visited or wrote to many Canadian churches and we were excited every time one of these churches responded back positively to say they would support us as best they were able to at that time. Then, God opened the door for us to return to Illinois. Jill was able to work at the hospital, and through prayer and the leading of God’s Spirit, we were able to visit about 28 churches throughout Illinois to tell them of our plans to be missionaries in PNG. How God led us to be able to speak in all these churches is another story in and of itself, but we were truly humbled and amazed to see so many places open their doors to receive us and to listen to our plans to serve God. By the end of 1996, everything was pretty much in place. The training was done, partnerships with churches and individuals had been established, and we were ready to go. All we had to do now, was get the entry visas stamped in our passports and we would be on our way to PNG. But that little story, will be the beginning of the next article. It has been a while since I gave a complete update on what we are doing. Many of our friends know some of the pieces of what is happening, but I want to lay out the full picture of our work and family so that you will know how to be praying for us and our ministry work. Our family is starting to head off in different directions. I will leave the family members till later, as nothing new has occurred yet. With regards to me, many of you probably know by now that I am currently in Dallas, Texas, and will be here almost up to Christmas of this year, a four-month period. I am staying in a dormitory style Guesthouse on the campus of the International Linguistic Center (ILC). The ILC is host to a number of mission agencies like Wycliffe Bible Translators, The Seed Company (a fund-raising group for overseas translation, literacy and other mission activities), the top-notch linguistic training school, GIAL (Graduate Institute of Applied Linguistics), and also the mission group that Jill and I have been a part of since 1995, Pioneer Bible Translators (PBT). The primary reason for me being here on the Dallas campus, for those who don’t know, is because of my health. The seasons of this last year, from fall through to spring, have been exceptionally cooler than normal. Definitely this past winter was tough on everyone, but with my muscle disease, it was very brutal on me and the colder it got, the more debilitated I was with the pain of my tightened and stiff muscles. And so the decision was forming in our minds by April this year to look at where I ought to be living when temperatures start to cool down. The obvious first step was for me to plan to do more consultant checking in Papua New Guinea (PNG) during the winter, but that still left the fall to consider. So when I talked with our Dallas office of PBT, they were very pleased that I would volunteer to help out in the fall, but even more so if I would consider coming down mid-summer. And so I am now here in Dallas. God has been so good to me this year to not only allow me to continue doing ministry work for Him, but God has opened up even more doors of opportunity than I could have ever imagined. As you all may recall, Jill and I went back to PNG during this last winter. I was there for nine weeks, the longest overseas trip since 2007, and Jill was able to join me for almost six of those weeks. She helped me with many of my daily needs, but had plenty of time to help the Branch out as well in various support roles. My primary role with PBT is to be a Bible translation consultant. When a team of missionaries and national people (or some projects have just nationals) have completed the translation of a book of the Bible into the vernacular language of the people, and have done a number of their own internal checks on the book, they then call on an outside consultant to do the final check of their translation before the book can be published. Last winter, we were able to finish Matthew in one language, check Ephesians, Philippians and Colossians in a second language, and then do the checking of Hebrews in a third language. In 2012, from mid-January through April, the tentative plan is to check two epistles for a member of a group called SIL (the name for Wycliffe field members), then to help one national team of translators get a good workable translation of the Gospel of John roughed out over a six-week period. And if I stay into April over there, I will work with a third group as a consultant or an adviser. Meanwhile, back to my time in Dallas, there is plenty the Lord has given me to do. The reason the Dallas office of PBT wanted me to come as early as mid-August was so that I would be able to help them by teaching an in-house training program (Intro to Linguistics and Second Language Acquisition) to some of our new missionary recruits. From now until Christmas I will spend about 15 hours a week doing this. And back to my primary job of doing translation consultant work, there is a great deal of preparation that I do to get ready to go over to PNG and do the checking of Scriptures. But there is one more consultant task that PBT has given me. Namely, there is a project in southeast Asia that has most of their New Testament close to finished, but which still needs the eyes of a consultant to check. And thankfully, that is something I can do by remote computer file sharing. So thank you Lord for giving me many areas of ministry to do for You. Finally, news about the family. Jill has not made a change of her residence or where she works. But she has made two other significant changes. She began a full-time line position on her Postpartum Unit at the Calgary hospital on July 1st. At the same time, she has begun some Master’s online studying that definitely keeps her busy when she is not working. She will be able to be with me for about 10 days in mid-October, and we are praying about how much time she can take to come over to PNG again in the next winter. And then the one other member of the family still living at home with Jill, might very soon be packing his bags. Glen has had his application to the Army accepted. He has passed the interview and medical exam stage. He got word that he is on the “Merit List” which is the call-up list. And so now we just wait for that last phone call, and then he will be off to Army Boot Camp training. We ask that you all please keep us in your prayers as we seek to follow the Lord’s leading. It definitely is exciting the number of things that we are all getting to do, but it does not mean that they will be easy to do. But we will walk forward by faith, believing that God will give us the strength to do what He has asked us to do. What my friend helped to do was to stir up the embers in my heart of wanting to serve God, and specifically to do so in a cross-cultural way. It was another college friend who also was living in Prince Edward Island at the time that wondered if I was going to do something about my love and ability to handle languages, and especially the original languages of the Bible, Greek and Hebrew. In further discussion with my friend, he suggested that I look into Lincoln Christian Seminary (now called Lincoln Christian University). He knew that there were excellent teachers of Greek and Hebrew there, and he had heard that they sometimes hired language assistants, and suggested that I look into that. So after a few phone calls, suddenly things were looking up as I began to enroll in LCS, and there was a tentative offer to let me be a Teaching Assistant in the undergraduate Greek class. So once again, Jill and I loaded up the kids (now age 2 and 4) and all of our stuff into a U-Haul and headed down to Illinois. We had fun tenting with our boys as we made our way through the northeastern States. And Jill passed a nursing exam while we passed through Vermont which would open the door for her to do nursing while we were in Illinois. We arrived in the middle of summer and got situated in the married student housing complex. It was less than a 10 minute walk to get to the Seminary. The difference between getting there in six minutes versus ten minutes was the choice of whether to go through or around the cornfield. It certainly was interesting to walk through corn stalks that were taller than you were. By late Fall though, the harvest was in and you could run straight across the dirt field. Within days of arriving in Lincoln, I had made contact with the professors of Greek and Hebrew. I was very disappointed at first to learn that they had already filled the spot of TA’s for the undergraduate Greek class. But then they asked if I would be interested to help be a TA in the first year Greek class for the Seminary. Wow! I couldn’t believe they would give me that opportunity. Of course I said yes, and I loved being a tutor for my fellow seminarians. Then I inquired about the Hebrew courses. It had been 7 years since I’d taken Beginning Hebrew, so I assumed that I would have to repeat the course. Well, the professor suggested that I take the three weeks or so that I had before classes started and review my Hebrew and try to pass a proficiency test. So…rather than playing in the park with my boys, or sun tanning with Jill, I dug into some Hebrew text books. Getting back into biblical languages was not the best thing that happened to me while in seminary in Illinois. Something else even more life changing happened. Shortly after we started the Fall courses, I had been talking to some other people on campus about my love for the biblical languages and my passion that I had always had to become a career missionary. Well one person suggested that I needed to meet a certain faculty member, because this man was known to be a Board member of a mission group that specialized in Bible translation. And so I did go over and meet this man and he told me that he was part of a group called Pioneer Bible Translators. He told me how it did much of the same work as Wycliffe Bible Translators, but was associated primarily with the church background I had come from.